Homes of varying styles, textures, and colors line the streets of any urban neighborhood of the City of Cleveland, each house contributing to the overall character and vernacular of the neighborhood. Every house site is then broken down into its own unique contributing components in the following usual hierarchical order: 1) the house, 2) the lawn, and 3) the landscaping (in order of most predominant to least predominant within the neighborhood and microcosmic site). memento proposes to investigate the contrast of an idyllic neighbor (that mentioned above) versus a neighborhood with abandoned or demolished housing stock, which is increasingly becoming commonplace in Cleveland. 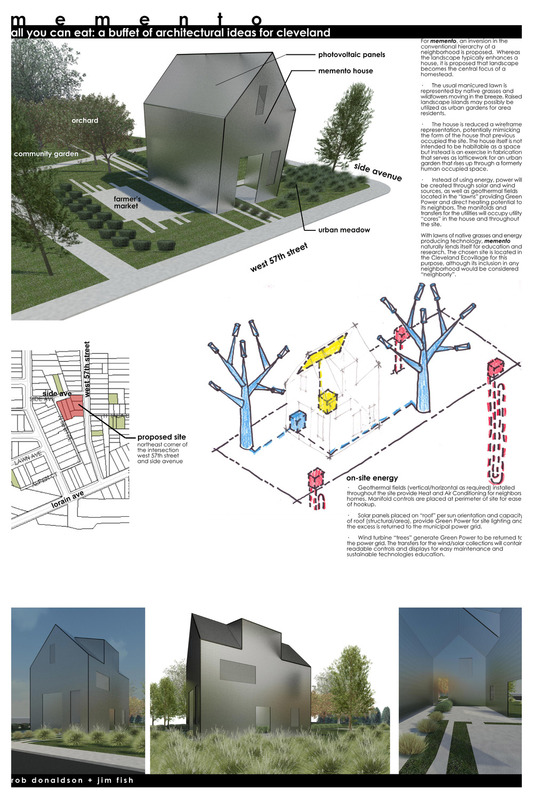 For memento, an inversion in the conventional hierarchy of a neighborhood is proposed. Whereas the landscape typically enhances a house, it is proposed that landscape becomes the central focus of a homestead. • The usual manicured lawn is represented by native grasses and wildfowers moving in the breeze. Raised landscape islands may possibly be utilized as urban gardens for area residents. • Instead of using energy, power will be created through solar and wind sources, as well as geothermal fields located in the “lawns” providing Green Power and direct heating potential to its neighbors. The manifolds and transfers for the utilities will occupy utility “cores” in the house and throughout the site. With lawns of native grasses and energy producing technology, memento naturally lends itself for education and research. The chosen site is located in the Cleveland Ecovillage for this purpose, although its inclusion in any neighborhood would be considered “neighborly”. • Geothermal fields (vertical/horizontal as required) installed throughout the site provide Heat and Air Conditioning for neighbors’ homes. Manifold controls are placed at perimeter of site for ease of hookup. • Solar panels placed on “roof” per sun orientation and capacity of roof (structural/area), provide Green Power for site lighting and the excess is returned to the municipal power grid. • Wind turbine “trees” generate Green Power to be returned to the power grid. The transfers for the wind/solar collections will contain readable controls and displays for easy maintenance and sustainable technologies education.